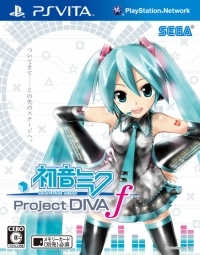 Description: Come with instruction card and an "AR Live Marker"
02-14-2014 nadozza Description Come with instruction card and an "AR Live Marker"
This is a list of VGCollect users who have Hatsune Miku: Project DIVA f in their Collection. This is a list of VGCollect users who have Hatsune Miku: Project DIVA f in their Sell List. This is a list of VGCollect users who have Hatsune Miku: Project DIVA f in their Wish List.